Ethical thought experiments such as the trolley dilemma have been investigated extensively in the past, showing that humans act in utilitarian ways, trying to cause as little overall damage as possible. These trolley dilemmas have gained renewed attention over the past few years, especially due to the necessity of implementing moral decisions in autonomous driving vehicles (ADVs). We conducted a set of experiments in which participants experienced modified trolley dilemmas as drivers in virtual reality environments. Participants had to make decisions between driving in one of two lanes where different obstacles came into view. Eventually, the participants had to decide which of the objects they would crash into. Obstacles included a variety of human-like avatars of different ages and group sizes. Furthermore, the influence of sidewalks as potential safe harbors and a condition implicating self-sacrifice were tested. Results showed that participants, in general, decided in a utilitarian manner, sparing the highest number of avatars possible with a limited influence by the other variables. Derived from these findings, which are in line with the utilitarian approach in moral decision making, it will be argued for an obligatory ethics setting implemented in ADVs. Anja K. Faulhaber, Anke Dittmer, Felix Blind, Maximilian A. Wächter and Silja Timm: Shared first authorship. The authors would like to thank all study project members: Aalia Nosheen, Max Räuker, Juhee Jang, Simeon Kraev, Carmen Meixner, Lasse T. Bergmann and Larissa Schlicht. This study is complemented by a philosophical study with a broader scope (Larissa Schlicht, Carmen Meixner, Lasse T. Bergmann). The work in this paper was supported by the European Union through the H2020-FETPROACT-2014, SEP-210141273, ID: 641321 socializing sensorimotor contingencies (socSMCs), PK. This study was planned and conducted in an interdisciplinary study project supervised by Prof. Dr. Peter König, Prof. Dr. Gordon Pipa, and Prof. Dr. Achim Stephan. Maximilian Alexander Wächter, Anja Faulhaber, and Silja Timm shaped the experimental design to a large degree. Leon René Sütfeld had a leading role in the implementation of the VR study design in Unity. Anke Dittmer and Felix Blind contributed to VR implementation. Anke Dittmer, Felix Blind, Silja Timm, and Maximilian Alexander Wächter contributed to the data acquisition, analysis, and writing process. Anja Faulhaber contributed to the data acquisition and the writing process. This publication presents part of the results of the study project “Moral decisions in the interaction of humans and a car driving assistant”. Such study projects are an obligatory component of the master’s degree in cognitive science at the University of Osnabrück. It was supervised by Prof. Dr. Peter König, Prof. Dr. Gordon Pipa, and Prof. Dr. Achim Stephan. Funders had no role in the study’s design, data collection and analysis, the decision to publish, or the preparation of the manuscript. Bonnefon, J.-F., Shariff, A., & Rahwan, I. (2015). Autonomous vehicles need experimental ethics: Are we ready for utilitarian cars? arXiv:1510.03346. Hars, A. (2016). Transformations 2025: How Volkswagen prepares for the (driverless?) future. Resource document. Driverless-Future. http://www.driverless-future.com/?p=1019. Accessed November 19, 2017. Li, J., Zhao, X., Cho, M., Ju, W., & Malle, B. (2016). From trolley to autonomous vehicle: Perceptions of responsibility and moral norms in traffic accidents with self-driving cars. SAE Technical Paper No. 2016-01-0164. https://doi.org/10.4271/2016-01-0164. Lin, P. (2013). The ethics of autonomous cars. Resource document. The Atlantic. https://www.theatlantic.com/technology/archive/2013/10/the-ethics-of-autonomous-cars/280360. Accessed November 19, 2017. Morris, D. Z. (2016). Mercedes-Benz’s self-driving cars would choose passenger lives over bystanders. Resource document. Fortune. http://fortune.com/2016/10/15/mercedes-self-driving-car-ethics/. Accessed November 11, 2017. Sikkenk, M., & Terken, J. (2015). Rules of conduct for autonomous vehicles. In G. Burnett (Ed. ), Proceedings of the 7th international conference on automotive user interfaces and interactive vehicular applications—Automotive UI’15 (pp. 19–22). New York: ACM Press. https://doi.org/10.1145/2799250.2799270. Winfield, A. F. T., Blum, C., & Liu, W. (2014). 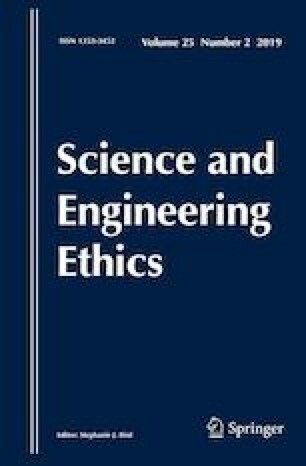 Towards an ethical robot: Internal models, consequences and ethical action selection. In M. Mistry, A. Leonardis, M. Witkowski, & C. Melhuish (Eds. ), Advances in autonomous robotics systems. TAROS 2014. Lecture notes in computer science (Vol. 8717, pp. 85–96). Cham: Springer. https://doi.org/10.1007/978-3-319-10401-0_8.